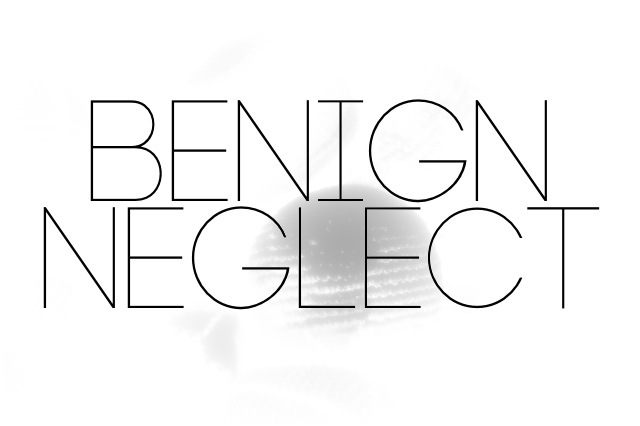 Benign Neglect — A 20somethings Disease? Tony Roos led me to this TEDtalks video discussing the pivotal developmental implications for someone in their 20s. Psychologist Meg Jay suggests that our society has encouraged an attitude towards "benign neglect" in the years before turning 30. "Benign neglect" is a behavior either that intentionally or unintentionally ignores responsibility by assuming there is plenty of time later to make those defining improvements that stabilize the future. In other words, it's the misguided attitude that it is okay to put-off self-management or life-responsibilities "now" because what happens today has few implications for tomorrow. This tendency towards making 30 the new 20 harms a person's relationships, identity and achievements. By releasing people in their 20s of the expectation of proactivity, Jay says that our society has "trivialized what is the defining decade of adulthood." Generally speaking, our society diminishes the expectations and importance of the young adult experience into a period of an extended adolescence. I've said many times in recent years that there is a reason why our society calls people in their 20s "young" adults— because our society is failing to view people in the 20s as "real" or "fully-developed" adults (as if there is such a thing—- see this post– 3 Bad Habits of 'Adult' Faith). "Whatever it is you want to change about yourself, now is the time to do it", she urges. In other words, "make the most of your 20s!" It's profoundly essential to be intentional in the college and young adult years. Coupled with the "last" real stage of brain development, the 20s are when most people set their final trajectory of thought. So if someone in their 20s lives in a stage of "benign neglect" (whether deliberately or not) then they could be signaling a life of dysfunctional commitments, unrealized potentials, inconsistent pursuits, in the future. Relatedly, Meg Jay also suggests that the "urban tribe is overrated." The idea that young adults can form self-serving silos of homogenous groups (think in the vein of "Friends") that meet all of their needs for belonging, identity and purpose is in actuality not developmentally effective. Everyone, at any stage of life experience, while needing the fellowship of peers, also needs intergenerational and heterogeneous relationships.